Welcome to Queer Music Heritage, and this is JD Doyle. I'm heard every month as a part of Queer Voices on KPFT, and frequent listeners of QMH may know that "Gay Spirit" by Charlie Murphy is one of the songs I've played most over the years. 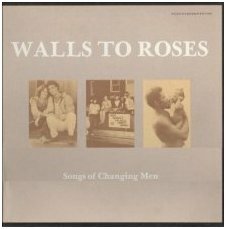 It's from the landmark album from 1979 "Walls to Roses." I did an in depth feature on that album last September, but this time I'm using its opening track to go in an entirely different direction. This is one of those rare shows where I'm not paying tribute to particular artists, but to someone very important who is behind the scenes. Did you ever wonder what a producer or engineer on an album really does, and what the difference is? Well, I'm one of those folks who pay attention to liner notes, such as the liner notes to the "Walls to Roses" album, and a name that kept coming up again and again in recordings in my collection is Karen Kane. 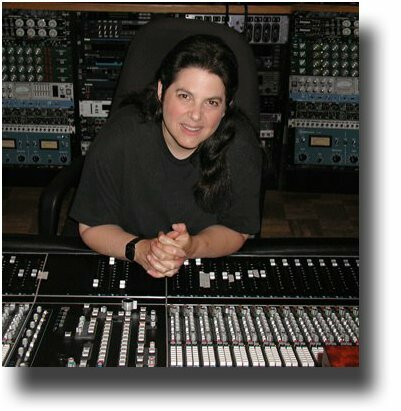 She's both a producer and an engineer and has had over 200 album credits, and countless live shows, in her career. She's been at it for more than 33 years, doing her work in Boston, Canada and now North Carolina. She's worked with a lot of artists dear to my heart and we'll talk about many of them as well as the work itself. And, later in the show we've got some before and after clips to show you what magic a good producer and engineer can do. Interviewing her has been on my wish list for quite some time, so let's get to it. Karen, how did you get started doing recording engineering? my parents had some friends and their daughter was a studio manager at a studio in Manhattan called 6 West Recording. And 6 West Recording was a three-room very busy jingle facility. And Beryl was looking for an assistant studio manager, reception, and I became her assistant, but within a year she left. And the owners offered me her job. So there I was, 20 years-old, the boss, at a recording studio. And I learned the business end of it, and I ran the studio, the day-to-day business of the studio. I knew enough to just get the mic through the board and hit record on the tape machine. And I'd make these recordings that were very amateur but I started playing with the equipment. And towards the end of my time there one of the engineers was sick one day and there was a recording, like a single mono voiceover track for a commercial. And they said, oh what are we going to do, we don't have any available engineers and I raised my hand and I said "I'll do it." And they're like "you'll do it?" and you know I didn't take myself too seriously and neither did they, but they thought, okay, I taught myself enough to just sit in front of a console and record one mono voice. I could do that, so I did do that session. And that was the defining moment of me taking it more seriously. And that was the end of 1973. I did a project for Joanna Cazden in 1977. I did the Lilith album in 1978. 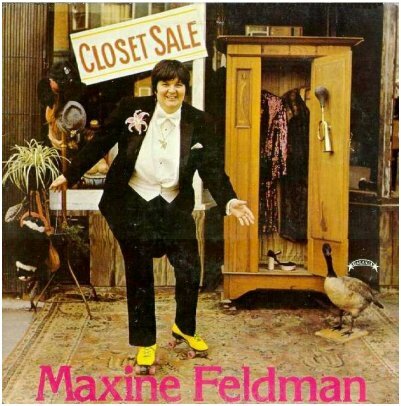 '79, I believe it was 1979 I did Maxine Feldman's album. That same year, I believe it was the same year, was the "Walls to Roses" project. So you just named some pillars of our history there, that you were right in the midst of. 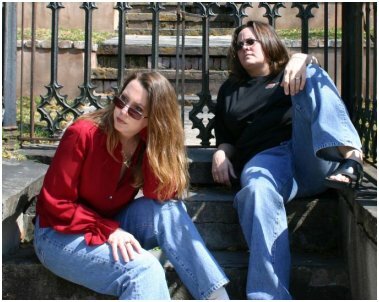 We were talking about Jade & Sarsaparilla; that was the name Linda Langford and Janet Hood used for performing and the name of their first album, from 1976, one of the earlier ones to contain, gasp, actual lesbian lyrics. Here's a little of their song "She's That Kind of Woman." of course I listened to every bit of it and then I contacted Beth and we had a little bit of a reunion, which has been really nice. The Lilith album was wonderful for me in that I was doing a full band project. 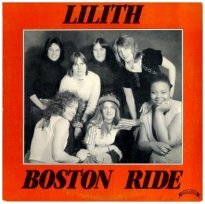 From that Lilith album, from 1978, is the title track, "Boston Ride." you know, the band dynamics were very hard and Beth and I basically mixed that album and made it happen, so we got very close in that process. And, now I listen to it and it's like, hmm, not too bad for 1978. You know, it helped them, for a while, with their career, but they were having such terrible band dynamic problems that they didn't last, unfortunately. A project that did last was "Walls to Roses"
you know, it just went on and on and on. Basically I have to give the "Walls to Roses" Collective the credit for me getting better at my work, because the interesting thing about this is that they hired me because they wanted to use a woman in a traditionally male job, so in the very beginning I got jobs because I WAS a woman. Whether I was good or not didn't even matter. [Those lefties] Yeah, really, exactly. So they hired me because, hey, a woman sound engineer. So I got those jobs and because of it, and it just kept happening and happening, and I got better and better and better. And I did, you know, God knows how many years, 12 years of all these acoustic albums. But I really have to thank that whole community for my beginning and all those albums that I did that helped me really become quite good at what I did. I've always put that album on a pedestal, as a landmark album, and finally this past year, as you know, got to devote an entire show to it. Yes I know. I listened to every word of it. It was wonderful. It was great. Thank you. I want to get to Maxine Feldman. and I have an album signed where it says "to Karen, the best producer a girl could have." And the joke is is that her and I produced the album and basically ignored the person who was credited as producer, cause I did not get credit as producer. So, that was a little hard but we were delighted to be able to do that project. Do you have a favorite track from that album that you remember? every single year. So for every year for the 23 years that I've been going to Michigan I get to hear "Amazon" and I feel very pleased and proud that I was a part of that. That's got to be quite a moving experience to listen to that there. Oh my God, Judith Casselberry usually is the person who does the music for the opening ceremony and they put together a full band and it's usually in a reggae format and it's just wonderful. And it's very moving, I have tears in my eyes when that happens, for sure, especially now that Maxine has passed. Right, I only spoke to her once, I interviewed her and we just hit it off immediately. She's that kind of person, she really was. 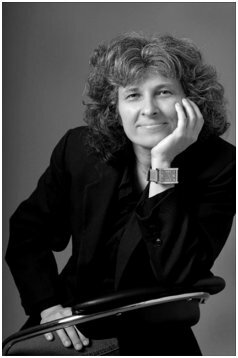 Of course that was the classic lesbian anthem "Amazon," by Maxine Feldman. It came from her only album, "Closet Sale," from 1979. It pains me that we don't have time for the entire song, but there's just so much of Karen Kane's career to cover that we're not going to be able to play full songs. Maxine introduced me to Kay Gardner. Kay Gardner, I don't remember exactly what year it was, but it was 1980, '81. Kay, once she knew about me. 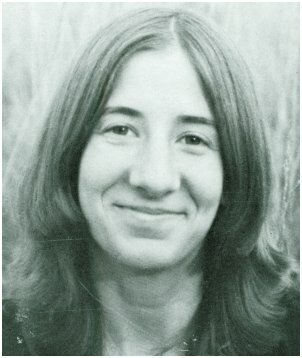 She gave me a small job of transferring some reel-to-reel tapes to cassette, and she would sit and tell me of her plan to write and record "A Rainbow Path." And then of course we got together and worked on that in 1983 and it was released in 1984. That was the beginning of a very, very wonderful relationship both personally and professionally. Kay and I were very close. That was incredibly hard. Kay Gardner passed away in 2002 and was at the forefront of composers creating lyrical music for healing, relaxation and meditation. 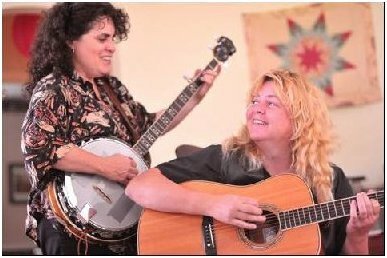 Karen and Kay worked on about a dozen albums together over the years, and from that first one, in 1984 called "Rainbow Path" is a little of a track called "Awakening." Let's take a step back and tell me the difference between the work of a producer and an engineer? you know, if you're going to have a hierarchy, the producer is the boss and tells the engineer what to do. And a producer does things like, okay, your guitar is out of tune, or you're singing flat, or yeah, the track speeds up here, and also works on arrangement changes with songs, which is done before you go in the studio. So the producer sits with the artist and musicians going into the studio and does pre-production. Pre-production prepares you for the studio and you work on the arrangements of the song, and you work on rehearsing with the people who are going to perform. Then you go in the studio and then you join up with the engineer, if there's a separate engineer, and that person is responsible for all the microphones and getting it all recorded as beautifully as possible. I would think if it's two different people it could vary from project to project as to who really contributed the most. Yes, that's true, that's very true. Actually I've heard stories of some very well-known producers who just sat there reading magazines. They got hired because of their fame, and they just sat there reading magazines while the engineer did all the work. [Or the engineer knew more] Or the engineer knew more, for sure. But I've been doing both for quite a while now. I think starting around 1985 or so I started to feel more confident to do both producing and engineering. I was going to joke with you that you started in '76, kind of, so this would be your 33 1/3 anniversary. [laughs] That's true. Whew, it's been a long time. A couple years ago I interviewed Tret Fure, who got her start as an engineer on the West Coast, and she talked about this, so I can't leave out this question. In the 70s for a woman to have a recording career was just out of the question. I started to get gigs. Here's a story, in the early 80s I worked at a studio called Euphoria Sound, where "Rainbow Path" was recorded, and I'm sitting at the board doing a session, and I'm obviously doing engineer's work, and there was another session scheduled in for the evening and some guy opens the door to the control room, comes in, looking all around, looks me straight in the eye sitting at the board doing work and says, "where's the engineer." So, I mean, the awareness was not there. I was going to ask if you also experienced not only because of being a woman, did you experience resistance in getting jobs for being a lesbian. I would say no, it was more the female thing. And I bet many of my listeners would be surprised to know that Karen engineered the first demo done by Tracy Chapman. One of my icons is Alix Dobkin. so I get flown to Sydney and I meet up with Alix and her entourage, this was 1990. I had found somehow the name of a recording truck, and I faxed them and asked them if they at this certain venue and they said yes and okay we set it all up. So then I get to Sydney and we did an afternoon show I believe, and an evening show. And during the evening show and I'm in the truck with the guy who owns the truck or the assistant, I'm not sure who it was, and he goes "what's this over here," and he hits a button, takes the recording machine out of record, so we're missing some bars of her concert. And so, you know, we put it back in record and then I had to do an edit. I had to take those many measures from the afternoon show and insert them into the evening show. The afternoon show was really just a backup, cause we'd have a larger crowd in the evening show, we wanted the evening show to be the main album. And so I edited the afternoon show to the evening show and the remarkable thing is, if the tempo isn't the same it would sound terrible. But Alix is so steady that it worked. [And the background ambiance was compatible enough, I guess] It was compatible enough in just a few measures. [How many seconds are we talking, roughly]. We're talking anywhere between five and ten seconds, so I don't think anyone would notice. I can't even remember what song it's on. If I heard the album I would not have a clue. [You did such a good job you couldn't find it]. Exactly. Here's part of the title track from the album "Yahoo Australia" by Alix Dobkin. Again, that was Alix Dobkin. 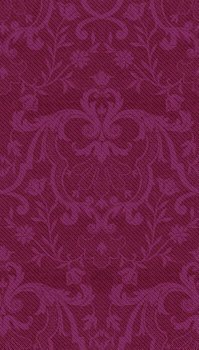 And this is a good time to invite you to check out my website. If you visit it while you're listening you can see the playlist and follow along, while looking at photos of the artists and recordings. I've always considered our music history as a visual as well as an audio experience. And this is another one of my shows where I had much too much great material for just one hour, so you can find Part 2 on my site. I had to make some very painful decisions on who had to move to the second hour, and that included hearing about Karen's work with some terrific artists, like Suede, Fred Small, Wishing Chair, Ember Swift, Alix Olson, and others. See what I mean? So you can find a second hour of this show on my site. Again, that's at www.queermusicheritage.com, Also, for more very queer programming, please listen to After Hours with Jimmy Carper, every Saturday night/Sunday morning from 1 to 4 am, on KPFT; it's Queer Radio, with attitude. Karen, how does live sound engineering differ from the studio? Oh it differs a lot. The skills are a little different, although I do quite a lot of live sound, and enjoy it a lot. A lot of live sound engineers have never been in a studio, so they don't know about the recording programs today, or back then they didn't know for instance how to calibrate a tape machine. They didn't know the difference between, you know, this studio mic and this studio mic, and there's a lot of things about the studio that you don't get to learn when you're at a concert. And there are lots of live sound engineers who do studio work but I was doing both early on, so that's why I was able to do both. But some can't. A live sound engineer who's never been in the studio couldn't just come into a studio and start working it. 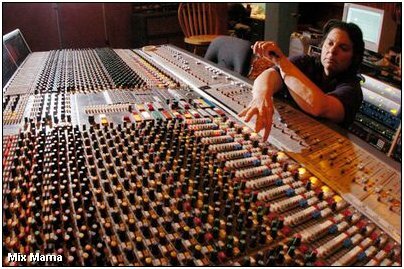 However, a studio engineer could very easily once all the equipment is set up go to a live sound gig and start mixing. it's a skill to learn how to do that. You don't have to deal with that in the studio, so that's something that would be hard for a studio engineer who doesn't have that much live experience. 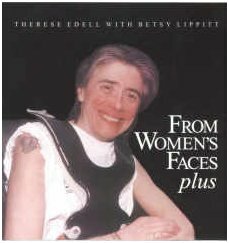 A very prominent live recording was "NWMF," National Women's Music Festival, their Silver Anniversary. they were so good, they let me take over and I did the whole thing and they just helped me in whatever way they could. It was a wonderful experience and then I got to mix all of it. It was quite a long project, it was great. As opposed to The Dyketones, they guys we hired for The Dyketones recording, you know, that was in P-Town, and we hired a well-known recording engineer and a truck. And I thought to myself, oh, I'll learn a lot from them. Well, as it turned out, they came to P-Town and thought they were on vacation. They'd be hanging out in the bars and the restaurant when they're supposed to be sound checking with me. You know they really took advantage of the situation, and I had to take over, which I did, they'd rather be on vacation. I don't remember seeing that on your album list. I don't know why, but I'm going to rectify that actually, I'm going to put it in there. Thank you for bringing that up. And she did add the Dyketones to her website's discography. The Fabulous Dyketones released one album, called "Live in P-Town," in 1988. When I did a feature interview on them on my February 2005 show I played quite a few songs by them, but didn't have room for this oldie but goodie, "Sixteen Candles." Okay, before we got distracted by the Dyketones, and that's easy to do, we had been talking about the live project Karen engineered. 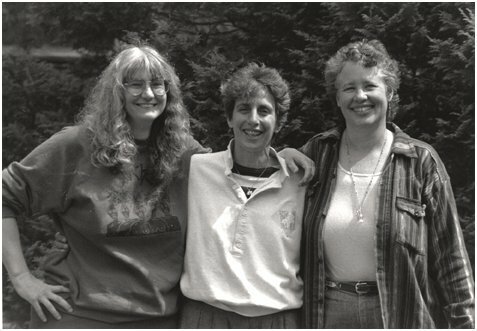 It was called "NWMF Silver" and was the 25th anniversary celebration of the National Women's Music Festival, and that year must have been terrific, with Cris Williamson, Tret Fure, Ferron, Teresa Trull, and Zrazy, among others. And one of those others was Janis Ian. That was a real highlight for me, doing that album, working with Janis Ian was a dream for me because she's I think by far my favorite songwriter of all time. [Wow.] 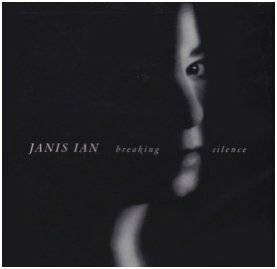 When she came out with that album "Breaking Silence"  I was blown away by that album and I used it for a lot of things. That album became not only for my personal pleasure, but I used it as a reference for myself to get inspired in the studio, and I would use it to compare what mixes I was doing to her mixes, cause I loved that album in many ways, musically, recording wise, mixing wise, and so it became a very important album to me. How was the interaction at the actual event? Well, that, talk about a highlight, was really special for me because I was honored and delighted to have a chance to work with Janis Ian. You know, it wasn't Janis Ian who hired me for the album, it was the producers of the festival and she happened to be in the line-up. But we connected really well because we had a chance to have some personal hang-out time and we found out that we had a lot in common. We were born in the same year, we both were Jewish, we both grew up in New York, and so we had a lot in common, so we hit it off. Professionally we also had some personal contact because she had to approve the mixes before the producers could use the recording and then get the CDs pressed. So I had some professional interaction with her as well as personal and it just was a thrill for me. From "NWMF Silver" here's a little of "Hunger" by Janis Ian. Ah, that's beautiful, just part of the almost eight minute performance of that song by Janis Ian at the National Women's Music Festival. Early in the show I mentioned that you would get to hear the before and after difference in the work Karen does. She sent me a very raw track called "Free" from the latest album by the duo Someone's Sister. Let's talk about Someone's Sister. Yay, Someone's Sister have become very good friends of mine. They live very close to me, and their second album has just been out not that long, it's a new album. And Georgia Winfree and Katherine Jones are incredible together, and they would give me, they'd give me demos that I would listen to and choose the songs, and I'd say I like this one, I like this one, I like this one, and so on. And of course they had a say in it but they wanted to know what I thought, so then we would all agree on the songs, and then we would go into pre-production and the demo I sent you has a rehearsal of one of the songs called "Free," that's the first cut of their new album. This is cool. Karen sent me a demo and also sent me the finished track so my listeners can hear the difference. Can you talk about what you did to get it to the finished product? Okay, here are very before version of the song "Free" and then the finished product. Want to hear more? That's from the brand new album by Someone's Sister, "Calm in the Chaos." And you can hear another example of before and after work by Karen on a song by another artist if you tune into Part 2 of this interview, on my website. I hear a lot of albums, especially by bands, where I think, I wish I could understand the words better. Well that happens a lot. I think one of my specialties is dealing with vocals and coaching singers to not only sing in tune but just the expression, and when I mix I make sure every word is heard. If I have to sit there and program in to bring up, you know, the end of a word, I do that for every vocal. You want to know what they're singing about. I don't want to leave out your nominations for the Juno Awards, the Canadian Grammys. I'm down to the last song. This went way too fast, and I want to thank you all for listening, and Karen Kane for the delightful interview. You can find out more about her work at her website, www.mixmama.com. And you can find much more of this interview at my site, at www.queermusicheritage.com. And, as always if you have questions or comments about any of the music I've featured, please write me. This is JD Doyle for Queer Voices on KPFT in Houston. 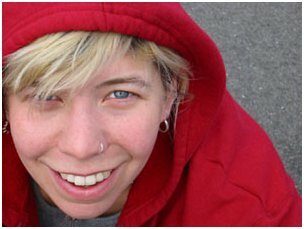 I'm closing the show with an artist out of Toronto who released a CD EP in 2008 that Karen produced and engineered. The CD's title is "I Am Who I Am," and of course the title track has an anthem quality to it, just perfect for this show. I would like to hear about your working with Anna Gutmanis. actually she emailed me and said, I have this project I want to do, can you refer me to any female producers in Toronto. And I wrote her back and said, no, not really, I didn't really know anyone who was female who was doing what I do there, believe it or not, in a huge city like Toronto. I really couldn't come up with anyone that would fit in, cause she actually really wanted to work with a lesbian. So I wrote her back and I said, you want me. And she wrote back and said, okay, what do I have to do? And I said, you just come to Wilmington. And so she came to Wilmington. I hired some musicians. We recorded at the bigger studio here, and mixed it at home, and away she went, and great songs that she did. She's a great musician. In particular can you talk about her song "I Am Who I Am"? Well, that's a song that's angry and needs to be out there, a great song. I'm thinking of ending the show with that song, cause I want something that is really more up. Yeah, it's pretty up [laughs]. It has that angry I-am-who-I-am, dammit. Yeah the lyrics are terrific and it's a great song. Welcome to Part 2 of Queer Music Heritage. This is JD Doyle and it's my May 2009 show, and it's a tribute to Karen Kane, and features just a few of the many recordings she's produced and engineered over the years. I opened this part with Marcia Taylor, doing her version of the Ginni Clemmens song "Solid Ground." It's from Marcia's 1983 vinyl LP called "Tinder," which she and Karen produced and mixed together. There was just too much of the great interview Karen Kane gave me to fit into one hour, so here's a second one. I've found over the years that if I've captured a part of our history, well, it would be a shame not to share it. So, let's get back into it. I want to go back to 1977 and ask about Joanna Cazden. as the tape is rolling and she's waiting to hear the guitar to sing to it's erasing the guitar. [laughs]. See I'm glad I got those out of the way early. And after that I calmed down and everything was fine. And I know that I was obsessive about trying to make the album sound as good as it could because I felt like I was still really learning [yeah, like you owed it to her] Absolutely. It was a great experience. Unfortunately there's so much to cover of Karen Kane's career that we're not going to have time to play full versions of all the songs, but that was a little bit of "Sunny Winter" from Joanna Cazden's 1977 album "Hatching." What instruments do you play and have you appeared on any recordings you've produced or engineered? I believe that was a Bright Morning Star album, I did a flute part. I don't really play flute anymore but I think whatever I played seemed to work for the song. And I've played a little percussion here and there. I'm not bad at doing that. I've played guitar, I play bass, but I feel like my instrument is the studio. Okay, could you pick out the flute part on that intro? Karen's probably cringing that I dragged that song out of obscurity. 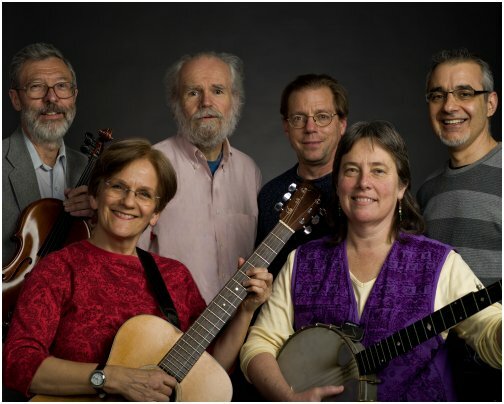 That was just the intro of "Vine and Fig Tree," from the album called "Arisin'" Karen engineered two of the albums by the group Bright Morning Star. Some members of that group I've played before on QMH, like Marcia Taylor, George Fulginiti-Shakar and Charlie King. How about Charlie King, him I've met. You've met Charlie. Well, there's no words to describe how wonderful of a human being he is. Yup, Charlie King, incredible songwriter. And I have the fortunate experience of going on tour several times with Bright Morning Star, doing live sound. And I got to know all of them very, very well. You know, driving for hours and hours in a big school bus you get to know people pretty darn well. Karen did the mixing on the 1979 album by Charlie King called "Vaguely Reminiscent," that was a little of "George's Trip." Charlie King has been recording for over thirty years and I've shared in the past some of his songs dealing with gay issues. My regular listeners can pretty much assume that unless I say so, the artists I play are GLBT. Charlie King is straight, as is this next artist, Fred Small. he hired John Curtis for a few albums, to produce, and I learned a lot about production from John Curtis, cause I was the engineer, John was the producer, and I learned a lot. And Fred knew how to pick his team, he researched it, and he hired John, he hired me, we hired the right studio, we hired the right musicians, and he just was pleasant all around, and so talented. I much respect the work of Fred Small, and Karen worked on his first three albums. He's very well known for his support of the gay community and has recorded a number of songs dealing with gay issues. One of his classics, recorded by many other people, is "Everything Possible"
From Fred Small's "No Limit" album from 1985, that was "Everything Possible," and also singing on that track was Priscilla Herdman. Can you tell me about working with Nancy Tucker? and Nancy Tucker is one of the funniest human beings on the planet. We laughed the entire time, and there's nothing more wonderful than doing your work and laughing. And so we had a wonderful time together, pretty memorable. [The album was "A Little Stronger" from '83]. Yes, yes it was. 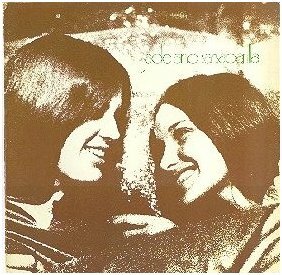 And from that album is the song "Heaven Is Gaining Altitude"
One obscure album I have in my collection is by Susan Graetz. she didn't have like an amazing voice or incredible guitar or banjo talent, but she wanted to make her music heard. And I was really honored to do her album. [Her lyrics were very out of the closet] Yes they were [Which I love] Of course, yes, of course. She was a raw talent and we became very good friends. Susan Graetz from her only album, from 1984, called "Somewhere Between," and of course that song was called "More Pretty Girls Than One." An artist who I think is delightful is Suede, and you worked on her first album. all of those songs on that album are other people's. [Yeah, well, how many songs does Streisand write?] Good point, very good point, exactly. I believe that's why I encouraged her, like you don't need to write songs, yeah, how many songs does Celine Dion write? [Did Elvis write?] Yeah, I do a lot of first albums for people, which I enjoy a lot, cause I love helping to develop an artist, and I feel like Suede, she did that album and took off from there and it was wonderful to see. And another incredible laughing every minute during that session. I met her in 1994 in Houston. She was doing a pride fest show and I got her off to the side and we just had a wonderful conversation. Yeah, she's great, she's great. From Suede's debut album in 1988, called "Easily Suede" is what I think is a classic song. It was written by John Calvi and speaks to those people who are still in the closet, and for whatever reasons feel they can't come out. It's called "The Ones Who Aren't Here." One of your live projects that ended up on disc was "For Therese"
whatever it was. And he was like, that's not possible, blah blah blah blah. And I said, well you come on over here and he did and sure enough it was that. And I remember only having like minutes before the show starting where I pulled together the recording. And from the 1990 tribute album "For Therese" is one of her much loved songs, "Good Friends Are the Best," done this time by Muse, Cincinnati's Women's Choir. And here's another live concert project produced by Karen, by a not too well known act called Yagottawanna. Oooh, three incredible voices, live concert, that's right, did a show and we mixed it at a studio, great studio that had a pool, ooh, it was a lot of fun, another lots of laughs session. Those are great girls, great singers. 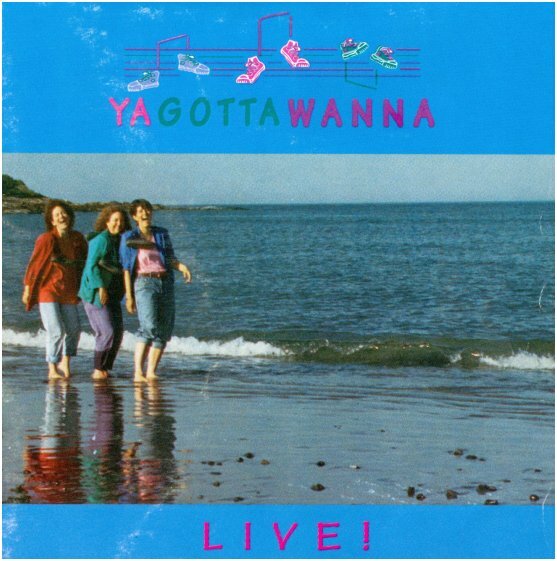 The trio that called themselves Yagottawanna unfortunately only released one album, "Yagottawanna Live," in 1993. It was hard picking which song by them to play, as the album includes some very touching songs as well as some that are very funny. But I picked a song I already loved, "Moonflower." Some of you may know Therese Edell's gorgeous recording of the Annie Dinerman song. Here is it by Yagottawanna. Another favorite act of mine is Wishing Chair and you did their first album. but it came off really well and then they brought me to Nashville to mix the album. That was a great experience. I saw Ember Swift perform at the Outmusic Awards in 2005, and she was amazing. From her 1999 album "Permanent Marker" is the song "Quickly." Just a taste of the talent of Ember Swift. In our emails I asked you to point out some memorable projects and you mentioned Vicki Blankenship. 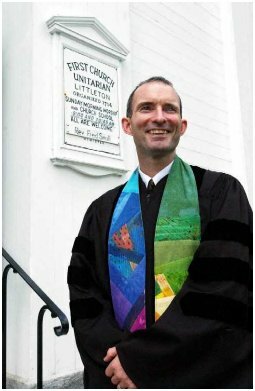 the nice think about Vic is that I moved to Wilmington, North Carolina, in '02, with my current partner, and with Vicki, Vicki kind of helped me get going in this area cause she lived here as well. One of the things that is memorable is that Vicki is struggling with some health issues, and watching Vicki take her life by her hand, and say I need to do music in order to live, and she's still going, and she has some pretty challenging health issues. And so doing those albums with her, I did her two albums, was a success story in someone who really needed to do their passion in order to keep living. If I would say to you, I'm going to play one of her songs, tell me which one to play. Oh, my favorite I think out of all of them is "Feels Good Home." I love that song, yeah, it's one of my favorites by her. She's a very good songwriter. A perfect intro. From her 2005 album "Horizons," here's Vicki Blankenship and the song "Feels Good Home." Oh ho, Alix Olson and her gang nearly killed me. [laughs]. Alix Olson, at the time of doing the album in '03, you know, was 27 or so, and I was whatever I was then, 52, and we all met in Woodstock to do this record. The energy level of all of them was hard to keep up with for me. I mean, I would do it again and again with her, because she's just so incredible. And I was staying upstairs in a loft above the studio, and so they're in there playing around until 3, 4, 5 in the morning, I can't really sleep, you know, I get up the next day and they're like, oh look what we did last night. It was an amazing experience. Ember was there and Lyndell was there, the person who plays with Ember, Lyndell Montgomery [She's terrific], Yes, she's an incredible musician. And Pamela Means was there, and Chris Pureka was there. And the album we're talking about, "Independence Meal," was really a different type of album to gain such popularity so fast. [more interactive] exactly, and to my ears it was very successful. That's not the sort of thing that I would have ever thought I would like, but I really respect that album. it's like, a spoken word album, how many times can you listen to that? is the feeling that a lot of people have, but it's musical, the album is musical. [And she's so sweet] She is, oh my God, she is an incredibly sweet human being. I see her every year at Michigan. That song was "Bedtime Poem" from Alix Olson's wonderful 2003 album, "Independence Meal." And I think you might have noticed why I moved that song from the broadcast version of my show, subject to FCC regulations, to the internet. On Part 1 of this show I promised you another example of what Karen can do to a raw track by an artist. I would try to get inspired about how I would want it to sound. So the album version, especially in the chorus part there's this George Martin-esque cello plucking that's going on, and the most important thing to me when I work with an artist is to maintain the integrity of their song. So many people have been unhappy with people who take their songs and over-produce them, or just destroy the integrity of the song, and I pay attention to that a lot. And I feel like with Amy I took all of her songs and created a tapestry around her, and gave her the support that she needed. Let's see how that turned out. The song is called "1 + 1" and it's by Amy Lashley from her 2008 album "For What It's Worth." And I can attest that recording an interview is definitely easier than editing one. An impossible question, what has been your most memorable recording session? I don't know if I can answer it. What flashed into your mind when you heard the question? to pick one out of them, really hard, really hard. [I know] You had to ask [well of course] of course you did. This JD Doyle and it's time to finish up Part 2 of my tribute to the work of Karen Kane, and again thanks for listening. And I've got a side comment. I've experienced this once before, when I interviewed Tret Fure. Here I am this kind of self-taught novice just playing with editing programs, editing an interview with an expert engineer, about their own work. Yikes. That's kind of daunting. Tret said I did fine, which I thought was very generous. I hope Karen is pleased as well. I want to close with another song by Fred Small, from an album engineered by Karen, one of three she did for him. This time the album is "The Heart of the Appaloosa," from 1991, and I've picked another one of Fred's gay themed songs. It's called "Annie."